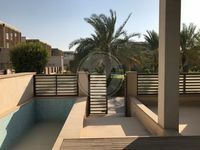 Four Bed Townhouse, Al Muneera. One month free! Lowest Price! 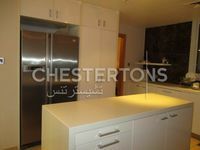 2 Cheques - 4BR Townhouse. 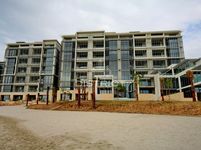 Al Raha Beach was developed by Al Dar Properties. 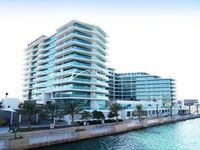 Al Dar properties is a real estate development, management, and investment company with headquarters in Abu Dhabi. Al Raha Beach is classified as mixed-use; the development has it all, the residential, the commercial, and the entertainment. It has 4 different sub-districts, Al Muneera, Al Bandar, Al Zeina, and Al Hadeel. What is great is that the development has villas and they are available for rent. So, how about a villa for rent in Al Raha Beach? As the name indicates, Al Raha Beach has a 5.2 million square meters of beautiful and natural beachfront. What adds to this turquoise water beauty is its surrounding of lush greenery and perfect landscaping. You can see how picturesque it is. What makes Al Raha Beach a great location for residents is its proximity Abu Dhabi Golf Club and Abu Dhabi International Airport. It is basically in the heart of Abu Dhabi, next to the highway that links Abu Dhabi and Dubai. On the other side of the water, you can find popular destinations such as Yas Island, F1TM race track, Ferrari World Abu Dhabi, and more. The development was structured to ease accessibility. Villas for rent in Al Raha Beach are very popular among expats just as it is among locals. They are architecturally beautiful, stylish, modern, and of high-quality. Couples, singles, or families, we promise, you will find the right villa for you; the numbers of rooms in a villa for rent in Al Raha Beach vary widely to fit all living arrangements. With this beautiful surrounding and high quality properties, living in Al Raha Beach is definitely a unique living experience. For amenities, with your villa for rent in Al Raha Beach, you can enjoy a private beach, an infinity pool, restaurants, cafes, gyms, underground parking, retail shops, supermarkets, a nursery, and more. Whatever you want you can find it there. In Al Raha Beach, you will come across many different types of transports, making it smoother to move across the development. Besides, you can always take a water taxi or a ferry to your destination. It is also a good idea to move to nearby locations on foot and just enjoy the beautiful scenery. Actually, that is the beauty of living in a mixed-use development. Everything is nearby, home, work, entertainment, they are all close. Basically, with Al Raha Beach, you get to enjoy tranquility resembled in the beach-front and the landscaped spaces, yet still be close to the city life with all its facilities. That is just everyone's perfect combination. We bet it is yours too. 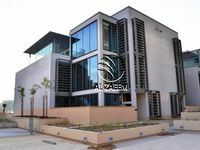 You can easily get yourself villa for rent in Al Raha Beach. Just Property has what you are looking for. Our list of villas is comprehensive, well-curated, organized, and user-friendly. It has been compiled by experts and is also constantly updated. It now time to look for a new home so enjoy the process and have a happy searching.